1986 Ohio inspection sticker - $20.00 : Bob Hoyts Classic Inspection Stickers, Add a Final Touch to your Restoration! 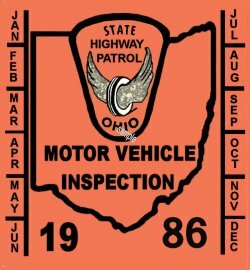 This 1986 Ohio inspection sticker is based on several others just like it in years before and after. We have restored the image and matched what Ohio appears to have a running color scheme. We have reproduced what we believe to be a very accurate reproduction. If you find an original image that is different, you can digitally photo it, send it to us, we will correct it and send you a free sticker.